Also serving communities of Othello. The average cost of assisted living in Moses Lake is $3,645 per month. This is higher than the national median of $3,345. To help you with your search, browse the 5 reviews below for assisted living facilities in Moses Lake. On average, consumers rate assisted living in Moses Lake 4.2 out of 5 stars. Caring.com has helped thousands of families find high-quality senior care. To speak with one of our Family Advisors about assisted living options and costs in Moses Lake, call (855) 863-8283. Named for the largest body of fresh water in the county, Moses Lake, Washington, is located in central Washington approximately 100 miles from Spokane and is home to 2,600 seniors (11.2 percent of the population). Seniors seeking assisted living in Moses Lake can choose from five assisted living facilities (ALF) in the area. The Washington State Department of Social and Health Services regulates ALFs in Moses Lake, and each facility is defined as a community licensed to care for seven or more residents. The state of Washington is considered a retirement tax-friendly state because it does not tax social security income. Because pension and retirement accounts are also exempt from taxation in Washington, the city of Moses Lake offers seniors the opportunity to benefit from tax cuts and save money for assisted living costs. Public transportation in Moses Lake is provided by Grant Transit Authority. Seniors qualify for half-off fare prices when boarding or $10 per month for a discounted monthly bus pass. The nearest major international airport is in Seattle, over 180 miles from Moses Lake. Moses Lake has an array of community resources for seniors, including the Moses Lake Senior Center, an organization that strives to obtain pleasant conditions for seniors through congregate meals, exercise programs and recreational activities, such as pool. Air quality across the United States is determined by the EPA based on an assessment of the number of harmful pollutants in the atmosphere (called the National Air Toxics Assessment). This evaluation ranks air quality on a scale of 1 to 100, with perfect air scored at 100. Based on this system, the air quality in Moses Lake receives a score of 79, 21 percent higher than the national average air quality score of 58. Seniors who enjoy spending time outside could benefit from the exceptional air quality in Moses Lake. The Moses Lake area is home to world-class medical facilities, including Samaritan Healthcare Hospital, in the event of medical emergencies or illness. The cost of living in Moses Lake is approximately 6.3 percent cheaper than in nearby Spokane. Though average utility and transportation costs are cheaper than the average costs in Spokane, seniors will find grocery and health costs more expensive. Assisted Living costs in Moses Lake start around $3,645 per month on average, while the nationwide average cost of assisted living is $4,000 per month, according to the latest figures from Genworth’s Cost of Care Survey. It’s important to note that assisted living rates in Moses Lake and the surrounding suburbs can vary widely based on factors such as location, the level of care needed, apartment size and the types of amenities offered at each community. 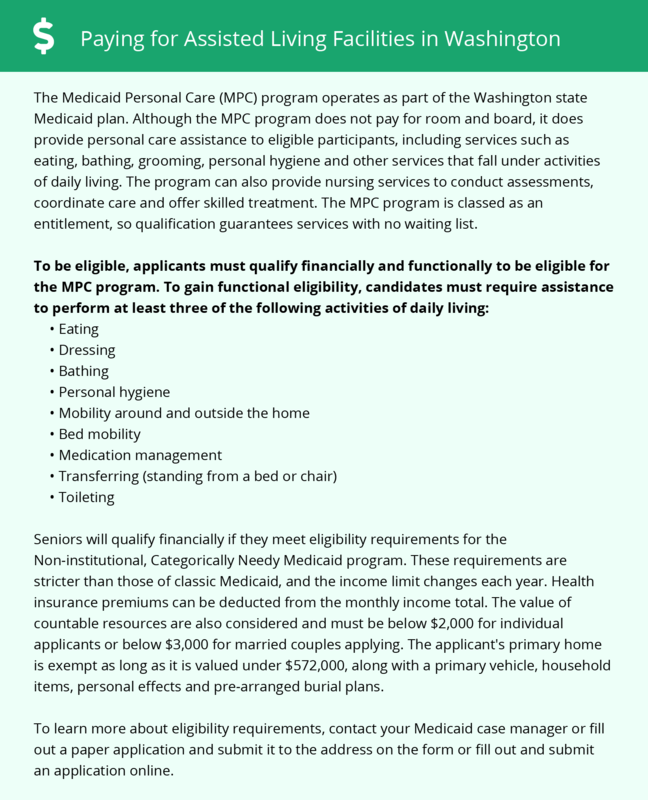 Seniors seeking financial assistance for assisted living in Moses Lake may want to consider Washington state's Assisted Living Facility Service Packages, a program that provides private rooms and occasional nursing services through Medicaid. Moses Lake and the surrounding area are home to numerous government agencies and non-profit organizations offering help for seniors searching for or currently residing in an assisted living community. These organizations can also provide assistance in a number of other eldercare services such as geriatric care management, elder law advice, estate planning, finding home care and health and wellness programs. To see a list of free assisted living resources in Moses Lake, please visit our Assisted Living in Washington page. Moses Lake-area assisted living communities must adhere to the comprehensive set of state laws and regulations that all assisted living communities in Washington are required to follow. Visit our Assisted Living in Washington page for more information about these laws.